Add your Cow Horse site? Scripting Provided By Rec-Outdoors MarketingGroup! Click to join Rodeo Cowboys Web Ring! Want to join the Roundup? Want to join the Bullriding Web Ring? This Hunting Camp site owned by King springs Ranch. Want to join theThe RodeoRing? This Hunters Outdoor Webring site owned by King SpringsRanch. Want more information about the Game Bird & Waterfowl Ring? This Ranches & Farms site owned by King Springs Ranch. Click Here to Join the Ring! Sponsored by Cattle Today Online! This Cowboy Up Wrangler Web Ring site, Is owned byKing Springs Ranch. 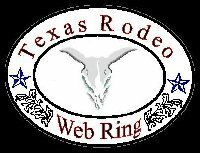 Click to join the Texas Rodeo Web Ring? This Texas Webring site is owned by King Springs Ranch.